Architecture in its most stripped down form takes the shape of a home, a unit constructed to protect its residents from the climatic extremes of temperature, storm, rainfall and the likes. A home amongst others is a basic necessity for the human survival, and owing to the aforementioned factor, climate becomes a primary consideration while designing and building any structure serving a purpose in the human way of life. It is because of the climatic variations that dwelling units vary in spatial systems and typologies across varied geographies of the world; the typical dallan style of the temperate Bengal won’t be suitable for the tropical heat of north India, and the architectural style of the arid zones of Leh would be very different in form from the styles prevalent in south India. 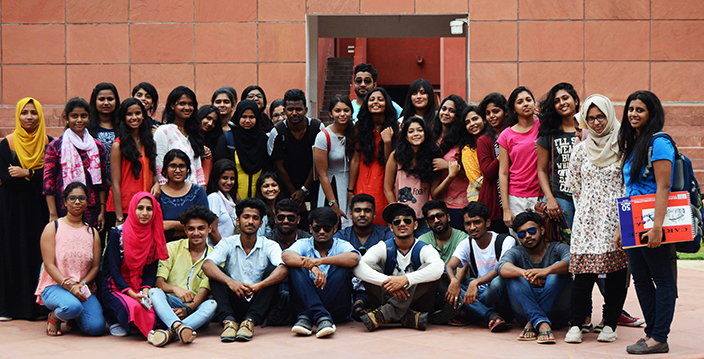 The students of the Nitte Meenakshi Institute of Technology, Mangalore set out to Jaipur for a short workshop trip on the impact of regional climate on the local systems of architecture of the area. Accompanied by Ar. Rajesh Krishnan from Team INKUISITIVE, the students aimed to understand in details how the arid climate of Jaipur influenced the local architecture and spatial planning. The target was to discover the various contextual situations and climate responsive techniques and how they are assimilated in the built form of residential and public spaces in the historic city and sites of Jaipur relative to human scale, activity, and environment. The workshop was coordinated by DRONAH foundation, Jaipur under the supervision of Ar. Pooja Agarwal, an eminent urban designer having extensive knowledge of the city. Two sites were chosen for climatic studies- Sisodia Rani ki Bagh and Thatheron ka Rasta, in Chowkri Modikhana located in the Walled city of Jaipur. The program started with the students taking a heritage walk of Ghat ki Guni (also known as Sisodia Rani ki Bagh) under the leadership of Ar. Ayush Bakliwal from the city. 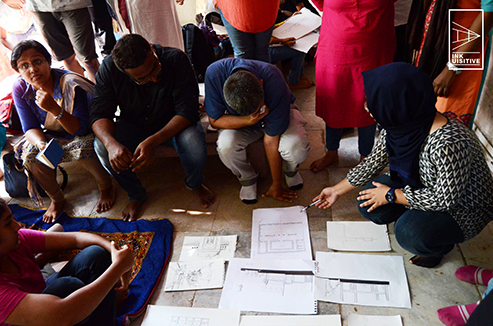 They were instructed in details on the history, construction and design philosophies embodying the place over a short tea break following which, the students started working in pre-assigned groups. They were instructed to sketch plans and sections showing the relation of the building to physical parameters like topography, climate, and culture. Following lunch, Ar. Ankur Jajpuria conducted a detailed session involving systematic organization of the sketches to produce a series of interconnected drawings elucidating the relationship of the building form and section with the existing climatic pattern. He explained to the candidates taking reference from their drawings about how the entire structure handles the local weather variations and the different forms of innovative elements that were devised to ensure passive cooling and keeping the temperatures moderate during the hot summers and the chilly wintry nights. 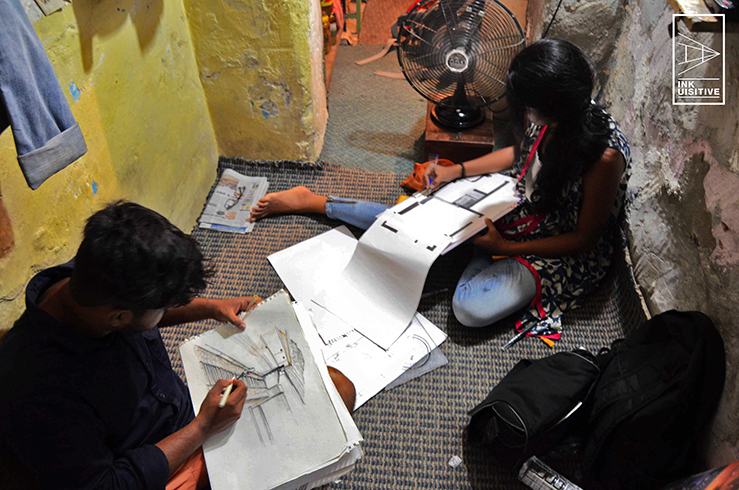 Come next day and the pupils found themselves walking about the Thathehron ka Gali, a narrow congested lane in the Chowkri Modikhana area inside the walled city. This place is occupied by thatheras, or the artisans who prepare beautiful metallic vessels by beating them with hammers. The entire lane reverberates the loud and continuous metallic gong sounds, providing viability to the name of thathera. The morning was spent on proportionately documenting the individual havelis assigned to the group of students, they sketched out the plans of the buildings prior to tea-break. After a short tea break, Ar. Anubhuti Chandana and Ar. Pooja Agarwal worked in tandem with the students, explaining to them the techniques by which climatic sensitivity has been incorporated in the buildings. The students drafted street and building sections which helped them to understand therelationshipn between mass and voids in the stretch. The coordinators then laid out the sketches and scrutinized them; these sketches were further utilized by the students to understand the light patterns- the effect of shading devices in letting light inside the house with relation to the solar movement, mutual shading by elements fabricated on the outer skin facing the street, as well as the pattern of air circulation inside the building. The main focus was on capturing how the built form responds to context and climate with the use of indigenous materials and its integration in a characteristic built form. In this two-day intense boot camp, the students developed a thorough understanding of how a design response is developed respecting local climate and location. Experiential learning took a different turn; this can be termed as observational learning as well. 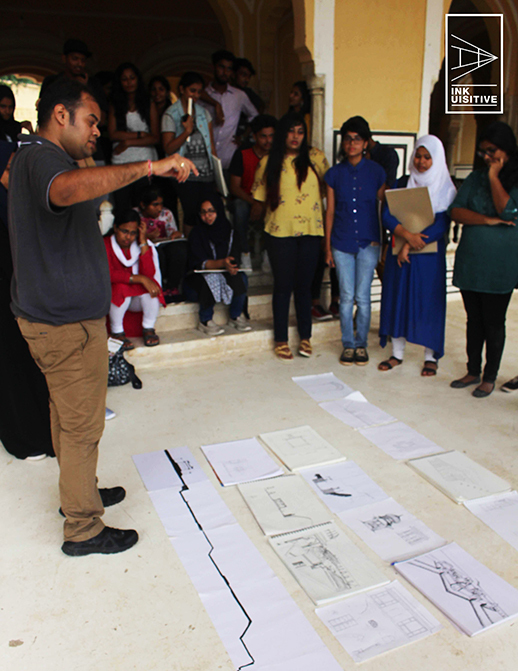 The students received training on representational techniques and designing through sections as well. Sketching is a vital activity for architects and the students developed a perspective on producing climate responsive building sections through this workshop based trip as well. We will very soon be updating you on our completed trips and upcoming ones as well. To know more, stay tuned. Till then, cheers!